psql is a simple command-line client for the PostgreSQL database and should be available on the linux machine at the university. 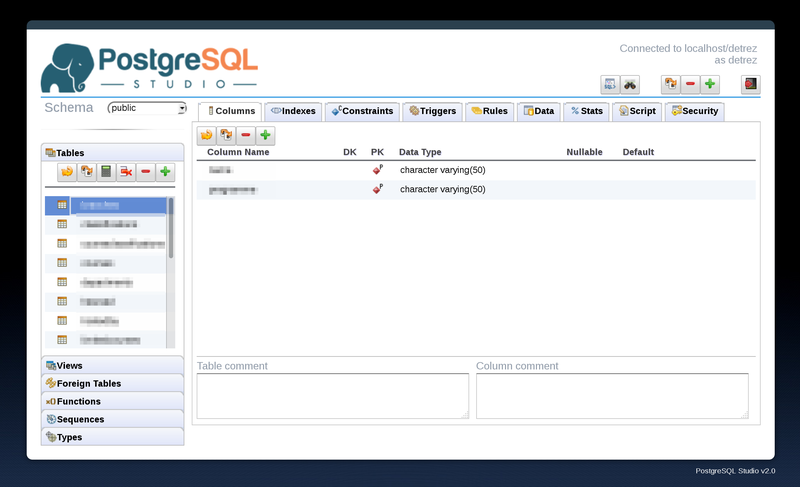 An alternative way to connect to the database is to use the web interface provided by PostgreSQL Studio. You can login in PostgreSQL Studio with the same credential you would use with psql, specifying localhost as the Database Host. 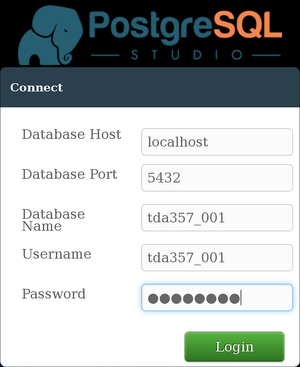 PostgreSQL Studio allows you to modify your tables, views, triggers and data using a graphical interface. But beware that, when submitting the different labs, you still need to have a script that can re-create your database from scratch. The database server is not accessible from outside the Chalmers network. This means that if you try the command above, psql will not be able to connect. Where <username> is your PostgreSQL username, and <newpassword> is the password you would like to use in the future. This command, like all other SQL commands, should be terminated with a semicolon. If you need to inspect your database, you can use psql commands. For instance, \d will list all tables and views, or \dft will list all trigger functions. Use \? to get a list of all the available commands and their description.